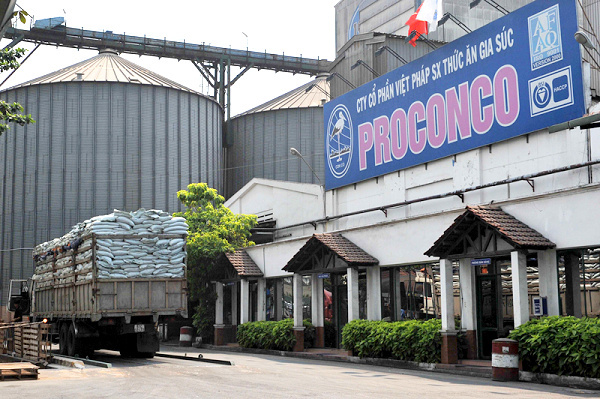 HA NOI (VNS) — Viet Nam National Seaproducts Corporation (Seaprodex) has approved a plan to sell all its stake in the Vietnamese-French Cattle Feed Joint Stock Company, better known as Proconco. However, many shareholders have expressed their disagreement with the company's plan. At the company's extraordinary shareholders' meeting held early this week, more than 20 per cent of the shareholders voted against this plan, but with 79 per cent agreeing to it, of which 63.4 per cent are state-owned stakes, the proposal was adopted. Proconco is the third largest livestock and aquafeed manufacturer in Viet Nam, with an 8-per-cent market share. It produced nearly 1.4 million metric tonnes of feed last year, the second largest by volume. Its best-known brand is "Con Co" (Stork). Seaprodex is the third largest shareholder of Proconco with a 17.47 per cent stake. The company plans to sell these shares at a price not lower than VND16,650, the book value of Proconco at the end of 2014. This investment is considered to be one of the most valuable assets of Seaprodex, which had VND1.25 trillion (US$55.6 million) in charter capital in 2014. The corporation can earn at least VND582 billion (nearly $26 million) from the sale. It plans to use this money to expand investment and pay dividend to its shareholders. According to Seaprodex's leaders, the divestment plan aims to ensure the best interests of the company's shareholders since Masan Group, Proconco's largest shareholder with a 52 per cent stake, plans a shift in the company's development strategy. After taking control of Proconco in April 2015, the Masan Group has been directing the company towards the 3F (feed-farm-food) model, without a dividend plan in the next five years. The group also holds a major stake in Agro Nutrition International Co Ltd (Anco) and Masan Nutri-Science Co Ltd, and plans to merge Proconco with these two companies. If the deal was inked, Seaprodex's leaders estimated its investment value in Proconco would be halved. Proconco's currently has VND2 trillion (nearly $89 million) in charter capital. The Masan Group is planning to raise its stake here to 70 per cent. Earlier, the Dong Nai Food Industrial Corporation (Dofico), the second largest shareholder with a 24 per cent stake, announced its plan of selling its 17.5 per cent stake in Proconco. The Institute of Agricultural Science and the Institute for Animal Husbandry under the Ministry of Agriculture and Rural Development (MARD) also have plans to divest from Proconco this year.